October 2013 | La-med Healthcare Pvt. Ltd. Conventional ventilator circuit 72 inch/1.8 mtr long in variety of configuration and accessories/components. 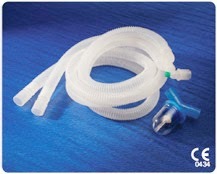 Made from soft easy to drape tubing of uniform ID, OD& thickness. Available with single and double water trap various configuration for adult and pediatric. Copyright © 2015 La-med Healthcare Pvt. Ltd.